Sold by Chery Enterprises and Fulfilled by Amazon. Gift-wrap available. In this clever and thrilling new TV series, charming con man Neal Caffrey (Matt Bomer) escapes from a maximum security prison, only to be recaptured by his nemesis, FBI Agent Peter Burke (Tim DeKay).With few options, Caffrey agrees to help the bureau bring down other elusive criminals in exchange for his eventual freedom. But before long, Caffrey finds himself playing a game of cat and mouse with those who want him back in prison - or dead. Co-starring Tiffani Thiessen (Beverly Hills, 90210),White Collar is sewn with surprising twists, engaging characters and riveting excitement. With commentary featuring Jeff Eastin, Tim DeKay, Tiffani Thiessen & Matt Bomer. With commentary featuring Jeff Eastin, Tim DeKay & Matt Bomer. of Neal Caffrey and Peter Burke. As another reviewer said..."maybe there's someone on television currently more rakish and dashing than Neal Caffrey. But, for the life of me, I'm drawing a blank." Well, I don't think there is, and this character has the perfect blend of boyish charm, intelligence and cleverness to go along with that mischievous twinkle in his eye. Matt Bomer inhabits his character with an ease and grace which belie his youth. Tim DeKay as the ever put-upon straight man, Peter Burke, is the G-Man who, despite his best efforts, can't quite keep it under wraps that he's got a heart...which would explain his gorgeous, intelligent and even more put-upon wife, Elizabeth (Tiffani Thiessen), whose contributions are always on point. And then there's the quirky man's quirky, Neal's behind-the-scenes guy, Moz, perfectly played by Willie Garson. So, the only question becomes ... how did the USA Network round up so many clever and witty writers to completely dominate TV? They're churning them out over there as fast as Mardi Gras beads in China. White Collar is a welcome addition to my other USA favorites, Burn Notice and In Plain Sight. With their winning combination of intelligent plots with fascinating detail (even to those who are afflicted with always-know-the-ending-itis), quirky characters with all-too-human faults, a large dash of humor, and exquisite casting, these are the best shows to come along in years. Who knew, years ago, when that defective detective with OC disorder premiered, and I thought, "Well, this is certainly different," that the USA network had revived and perfected the hour long Action-Dramedy? I haven't seen anything as compelling and entertaining as the USA line-up since Northern Exposure or Due South. Really my only complaint is the seasons are TOO SHORT! (Well, and a wolf would be nice, too...) But that can be forgiven, as USA budgets are probably not in line with some other networks out there. Though, if advertisers are paying attention, they soon should be. Keep it up USA! You are the bright spot on my TV! White Collar 1 is catchy. Me and my husband thought, "oh, this will be another soap opera"... but it wasn't! After watching the first two episodes we were addicted. Neal Caffrey is a man who is convicted of bond forgery and possibly committing other crimes escapes from prison by planning every detail of getting out. After getting caught, he makes a trade with Peter Burke the FBI Agent who captured him to put a tracking bracelet on his every move and help the FBI capture other art forgers. A very clean TV show, with good comical humor me and my husband loved watching this when we got home after 70 hours of work to take a small break from our busy lives. It has been our favorite ever since, hence why I continue buying these episodes. Neal & Peter end up becoming partners, and become one of the top 90% in capturing crime, and it's easy to see why. They both accomplish lots, and think of awesome ways to capture the thieves! I really enjoyed the first season of White Collar. The cast was nearly perfect in the pilot, and the plot was riveting throughout the season. I enjoy the relationship of Peter Burke and Neil Caffrey and the supporting cast was usually great, too. I'm glad they brought back Diana in the finale as the replacement was pale in comparison in more ways than one. I enjoy seeing a happy marriage on TV. Please, keep that going and don't break them up as so many shoes do. Mozzie is a really interesting character, but I think that Agent Jones needs more air time as he is very appealing, too. I enjoyed this show so much that I immediately bought the second, third, and fourth seasons after I watched this one. The premise and plotting are that interesting and I fell in love with Dihann Carroll years ago, and it is good to see her back on television as the slightly roguish June. 5.0 out of 5 starsNo starch around this collar! "White Collar" is a delightful television series. Matt Bomer is simply gorgeous -- one of those rare men who are actually physically beautiful -- a pleasure just to stare at; but the actors are all excellent, the stories are clever and inevitably entertaining, and the relationships are a pleasure to observe. I'm especially pleased that the series features a happily-married couple ("Suit" and "Mrs. Suit") who are genuine helpmates and fun to-boot. I also like the interaction between Neil and Mozzi and the growing trust and friendship between Neil and Peter. 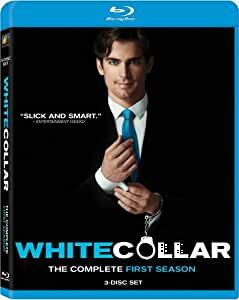 If you like "Hustle" or "Burn Notice" or "Leverage" I imagine you'd enjoy "White Collar". I'm just glad to have one more television series -- in a dwindling pool -- that isn't about murder, serial killers, twisted anti-heroes, lawyers, doctors, or failed marriages. Hooray for "White Collar"!